On Friday we started a “spur-of-the-minute” room redo for my daughter Hannah. Do you ever do those? It seems like a good idea at the time – three days later you start to wonder lol. Seriously, it has turned out to be such a fun project. But DIY ideas seem to take so much longer than you think they will. The room is coming along. It’s going to be so cute. 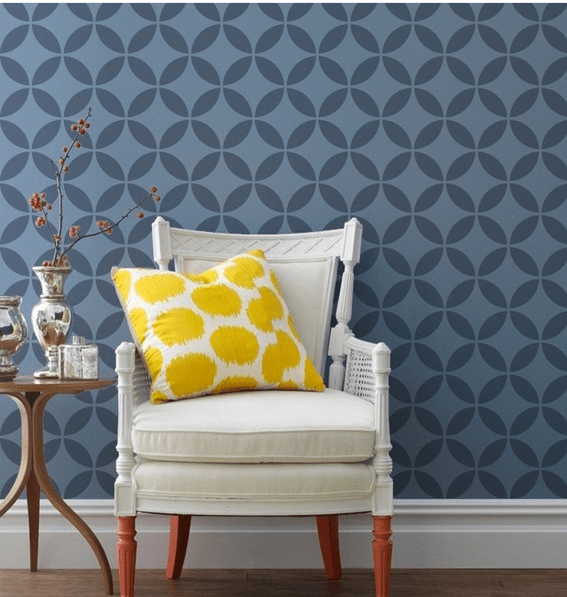 We I stenciled one of the walls with a modern design – Endless Moorish Circles from Royal Design Studio. Hannah is almost 14 and she has always been really into fashion and accessories. 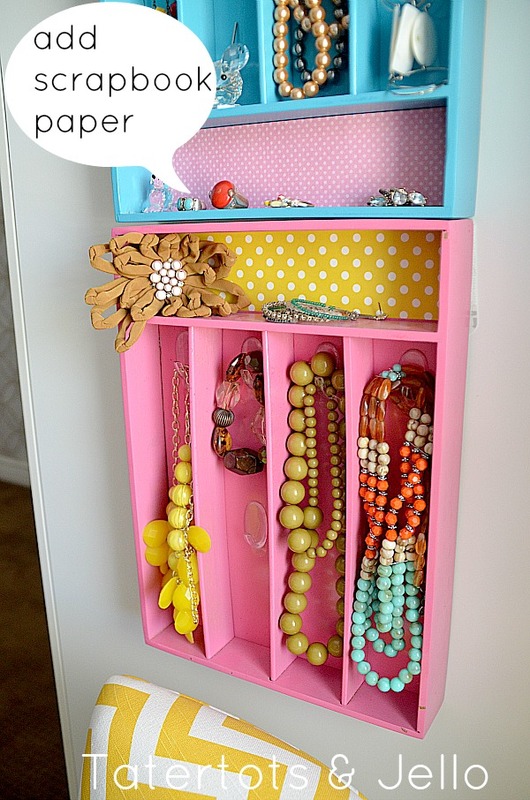 So I thought it would be fun to make a focal point in her room to display her jewelry. 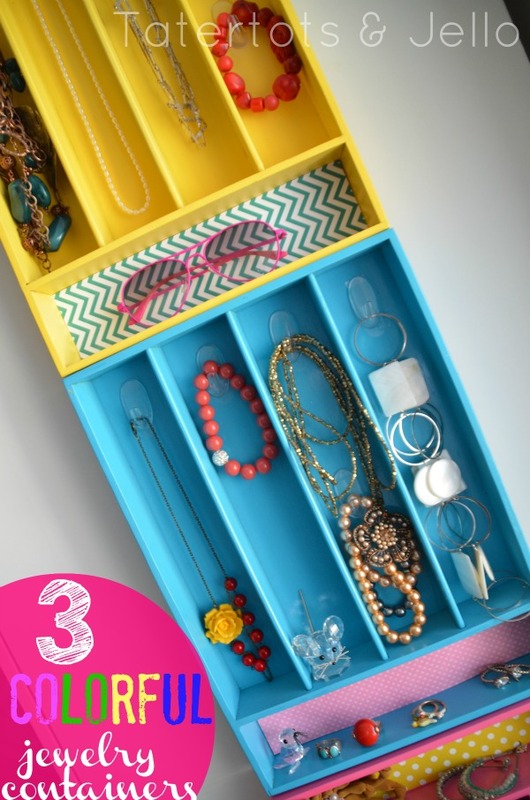 And I had such a fun time making the Chalkboard Jewelry Container out of a Silverware Tray, that I thought it might be fun to make a similar project,also with silverware trays but more colorful for her new space. Hannah loves her new jewelry display. And her room is almost done. I am so excited to show it to you!! PS — Here is another silverware tray, turned jewelry container that someone mentioned to me that is on Pinterest — it’s from Mini Manor Blog. With all-white silverware trays. So pretty. Here is another idea, using silverware trays horizontally from BlackForest on Etsy. 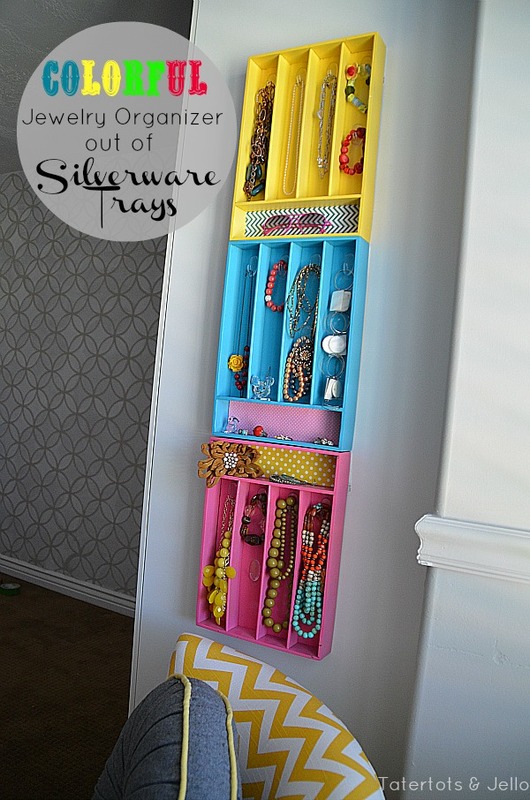 Here’s another silverware tray to jewelry organizer with mod podged backs from Homemade By Jen. 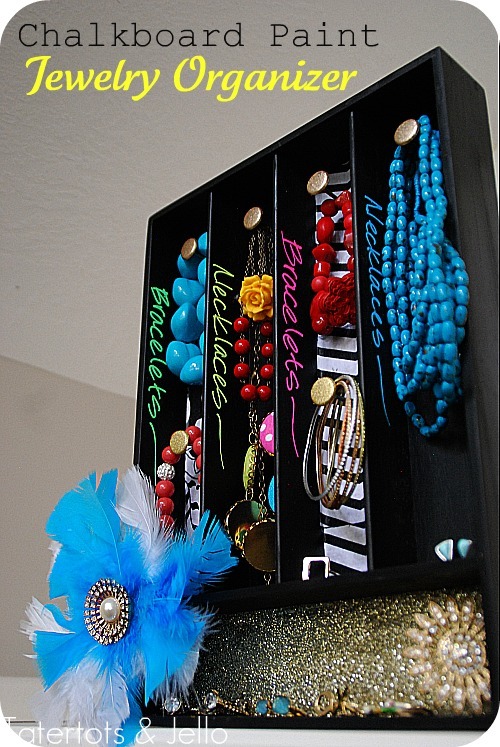 Thanks Command Strips for the awesome products to help make this jewelry organizer! PS — I’m linking up to The 36th Avenue!! Make Personalized Room Signs (Kids Craft)!! 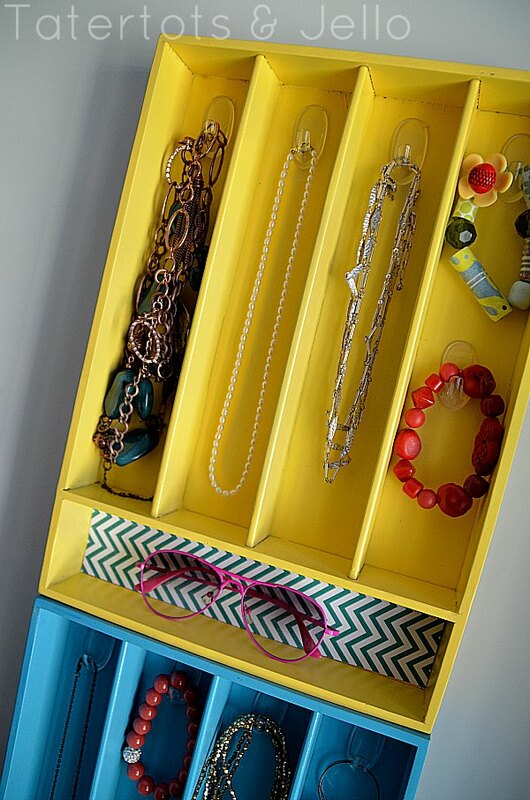 Great Ideas — Build It: 20 Home DIY Projects!! First of all I can’t believe you linked up to my party. I love you! Anyways, I am stopping by to let you know that you are getting a STICKER tomorrow. I love you Desiree!! You are the sweetest person. If you hang them on a straight surface nothing will fall out. We have rings and sunglasses sitting on the small shelves on ours and they have had no problem staying inside. I really have not seen that post but I would love to give that post a link. Do you know the name of the blog? Please let me know. Thanks!! This is such a cute project! Are these silverware trays wooden? These are awesome! I kept seeing the type tray ones on Etsy, but didn’t want to shell out the money, or have to buy a printer’s tray and refinish it. This looks much easier, and in my budget. So excited to try it! Yay!! Let me know if you make one Sarah. I would love to feature it!! Okay that is just cute! Love the color and the chair too! Can’t wait to see it all finished. I’d love to have you link this up on Titus 2 Tuesdays. Hope to see you there! I love the color of the room and the stenciled wall. It looks fabulous!! I can’t wait to see it when it’s finished! Such a cute idea! Love the colors & I can’t wait to see the end result! 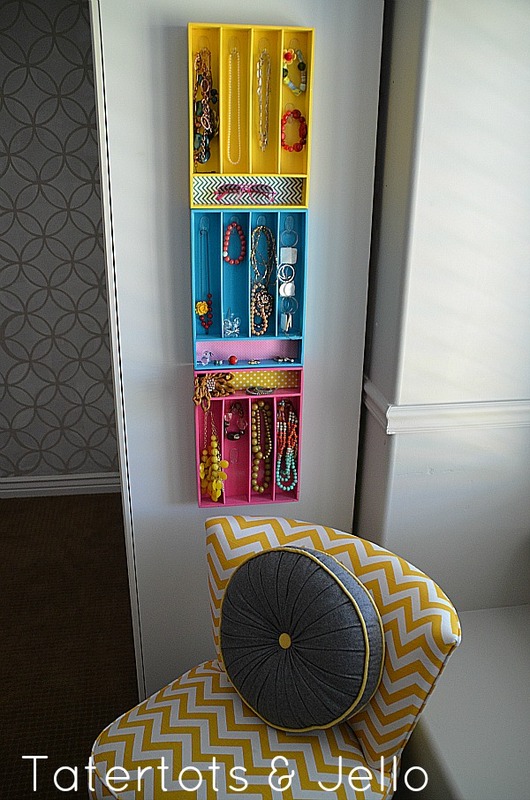 I am getting ready to re-do my 9 yr. old daughter’s room & I will keep this idea in mind – she would probably lOVE it! How fun Laura!! I am excited to see what you do with your daughter’s room. I think redoing kids’ rooms is so fun. They get so excited!! So super cute! Love how fun and colorful it is. Perfect idea, just love it 🙂 Bet she does too. I love the colours – they really pop! I have seen this before but you have definitely made it look so adorable…I love the color selection!! Thanks denyse!! It is such an easy project but I think the color really makes it pop and makes it fun! Please comment on the 3 units that are left of the window. Where purchased? Thanks. Jen those are so cute! I need something like that in my bathroom! Right now all my jewelry is a jumbled mess! I love the stencil too. I have a stencil that I won in a giveaway a few months ago, but I still haven’t gotten up the nerve to paint anything with it yet! Hi Kelli!! Thanks!! You should get your stencil out and try it. I think you will love it!! What a neat idea! 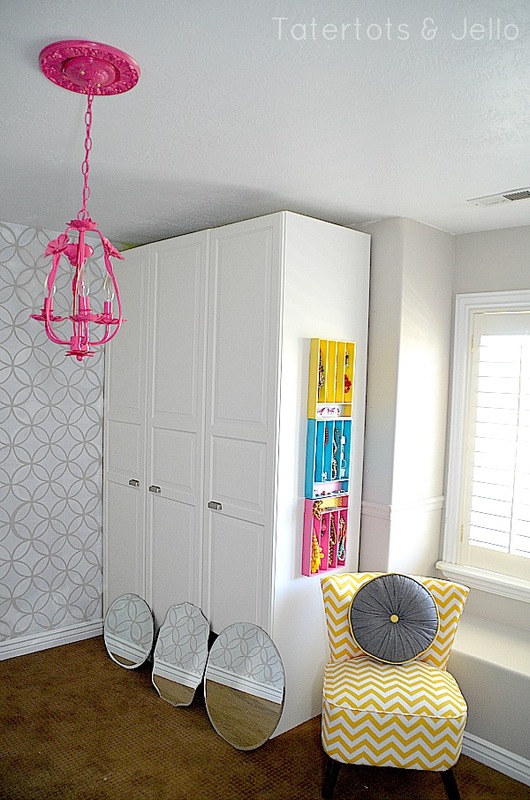 And Hannah’s room is looking awesome – can’t wait for the reveal. Thanks Shannon!!! It is turning out so cute. I can’t wait to see it all finished. Thanks for the sweet comment!! I love it!! I think I may do the chalkboard version for my new bedroom!! I have to ask… Where did you find the amazing chair? Hi Heather!! You should make the chalkboard version. I love those chalk pens. They look so amazing on the chalkboard paint. I got the chair in the Spring from Urban Outfitters online. This is such a great idea! Can’t wait to see her room all finished! Thanks so much!!! Her room is really coming along. I only have a couple more things to do before I can show it all. It looks so much bigger. It’s amazing what paint can do! !